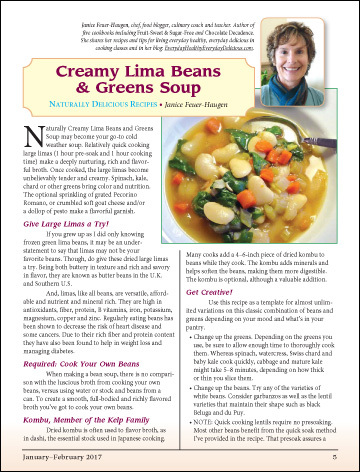 Naturally Creamy Lima Beans and Greens Soup may become your go-to cold weather soup. Relatively quick cooking large limas (1 hour pre-soak and 1 hour cooking time) make a deeply nurturing, rich and flavorful broth. Once cooked, the large limas become unbelievably tender and creamy.